About 10 years ago I tore the meniscus in my right knee. The meniscus is cartilage that keeps your thigh bone from grinding against the lower leg bone. It helps cushion your walk and stabilizes the knee. The symptoms are swelling, pain, clicking, and instability. It was no longer trustworthy. I had an MRI which showed 2 tears in the outside of the meniscus. The orthopedic surgeon recommended a procedure where they cut out some of the cartilage. He described it as a minimal procedure. I would be on crutches for two weeks and I would have a better knee. Recent studies have disputed this approach. In this article they conclude that in the long run it doesn’t really help at all. Being in the massage and movement education profession, I thought this was a great opportunity to learn how to rehabilitate my own knee. I could always have the surgery, but once done I couldn’t undo it. A colleague of mine had this surgery and he regrets it. The knee became unlevel and caused problems in the ankle, hip, and spine. Just to make it interesting I signed up for the Marine Corps Marathon so I would have to solve my knee issue. It was 26.2 miles or bust! This may not be good advice for the average person. It was an advantage to have the knee injury, as it gave me good feedback as to the effectiveness of my running. If I landed too hard or at the wrong angle it hurt and swelled up. Over the course of several months I increased my mileage up to 20 miles. I had many learning experiences. 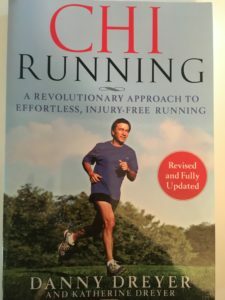 I took lessons in Chi Running. This combines the whole body movements of tai chi with running. It is described as “legless” running. There are books, DVDs and coaches in this method all around the country. It is a very doable method. The author, Danny Dreyer keeps the lessons simple. Another approach I tried was called Pose running. 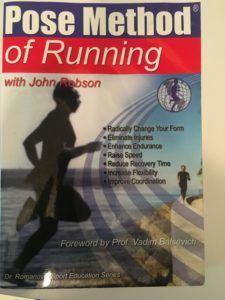 Nicholas Romanov a Russian running coach put this method together. It emphasizes the lifting leg as driving the run versus the one on the ground. This also sounded good. Again I bought the book, watched the DVD, and took a lesson. My knee liked this approach. You can’t hurt your knee when it is in the air. It emphasized a number of strength drills to support his method. I even tried barefoot running. 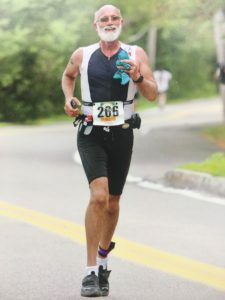 For several years I was a member of the Bare Foot Running Club, and ran a couple of races unshod. 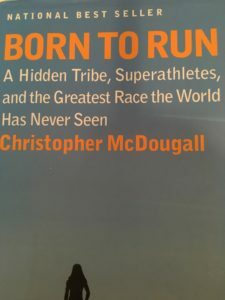 I took a class with Chris McDougal the author of Born to Run, a major best seller and great read. The book is about a 50 mile race in Mexico between ultra marathoners and a tribe of Indians called the Tarahumara who were known for their long distance running. My very first step changed my running. I quickly discovered that it was very painful to run and land on my heel without the thick padding of running shoes. One of the running experts in the book is Irene Davis, PhD, PT She specialized in running injuries. I did a 2 hour evaluation with her. She videoed my run and tested my core strength. Although interesting, this information didn’t lead to any real change. She did confirm that barefoot running was good for knees. By running barefoot I learned to run softer and strengthen my feet and lower legs. There are several books on the subject. Micheal Sandler and Ken Bob Saxton have very readable ones. I have to warn you that there is a long learning curve. It is very easy to go too fast or too far in the beginning. Until you have improved your mechanics and developed stronger ligaments you risk a variety of injuries. This past year I took an advanced Feldenkrais training called IOPS, Ideal Organization Profound Strength as well as 5 days just on the mechanics of the foot. This took 18 months, multiple trips to NYC for 4 day seminars, many on line classes, and one on one lessons from very good teachers. With all this education I dramatically refined my body mechanics. I added many details to all of the above approaches. I like to think that every cubic inch of your body runs. The more the whole body acts in a congruent way, the less damage to the joints and the more fun it is to run. The tissue that connects the muscles and bones is called fascia. I confirmed this idea by manually releasing the fascia of the feet, legs, thigh and pelvis so that it was all going in the same direction at foot strike. After doing one leg I ran and the feeling was like I had one shoe on and the other barefoot. I went up on the treated side and down on the untreated side. It was only by creating this contrast that I realized how light one can run. It was an exciting revelation. Currently I am doing an on line running camp with Jae Gruenke, a Feldenkrais Practitioner specializing in running. I took her class when she came to Boston to work with elite runners training for the Boston Marathon. From her I learned 2 important things. The angle of your head and the position of your hands changes where you land on your feet. Recently I demonstrated this to a person running on a treadmill. By simply increasing the distance from the chin to the chest she sped up and landed more in her mid foot. The reverse is also true. Pull your head back and you feel heavier and run slower. Try it for yourself. At this point in time I feel that running is now good for my joints. There is no longer any swelling of the knee. I can now work on my speed without fear of knee damage. There is no strain. I wonder what a follow up MRI would show? Since that diagnosis of multiple torn menisci I have run many 5ks, about 10 sprint triathlons, and 2 full marathons. My knee is better now than when I started. I can touch any part of it without eliciting any soreness. Indeed we have a miraculous body. It can heal itself if we apply some kindness and sensitivity as to how we use it without abusing it. I will be writing more about this in future blogs.